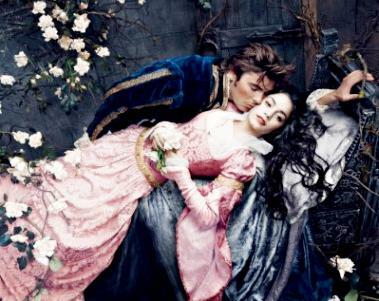 On-and-off-screen lovers Zac Efron and Vanessa Hudgens re-enact “Sleeping Beauty” famous characters, Prince Phillip and Princess Aurora, in the latest installment of a popular Disney ad campaign titled “What Will You Celebrate?” Their photo, which was dubbed “Where Romance Is Celebrated,” was snapped by famed photographer Annie Leibovitz back in December 2008. The picture shows Zac’s Prince Phillip giving Vanessa’s Princess Aurora a kiss on her cheek that awakens her from her long sleep. The image will appear in Disney Twenty-Three, a new entertainment and lifestyle magazine that will be launched on March 10 at Disney.com/D23. Efron, 21, and Hudgens, 20, aren’t the first celebrities to portray iconic Disney characters for Leibovitz’s lens. Tina Fey took the role of Tinker Bell in a Peter Pan-themed shoot. Other celebrity participants include: Jessica Biel (as Pocahontas); Jennifer Lopez and Marc Anthony (as Jasmine and Aladdin); and Beyoncé (as Alice in Wonderland).